Today's theme ... critters. This small ground squirrel attacked the bird feeder. He's become quite fond of the bird feeder and spends most of his day collecting seeds. He does allow the birds to eat but as soon as they're off he's back on it. Silly, silly squirrel. He looks so cute, and it's good that he doesn't mind sharing. He must have a family to feed somewhere. 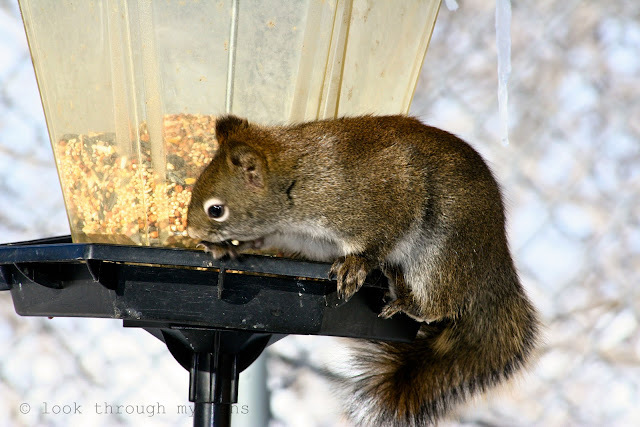 Nice capture of the squirrel at the feeder. He looks very content. I have squirrels that don't let the birds eat at all. I also have black squirrels (hey, my city is racially diverse, after all!). Nice capture of the little guy getting his meal. This is just an awesome capture...the shallow DOF really brings attention and great clarity to the squirrel and feeder! Very cute! What a cutie! Looks like you're practically holding it!